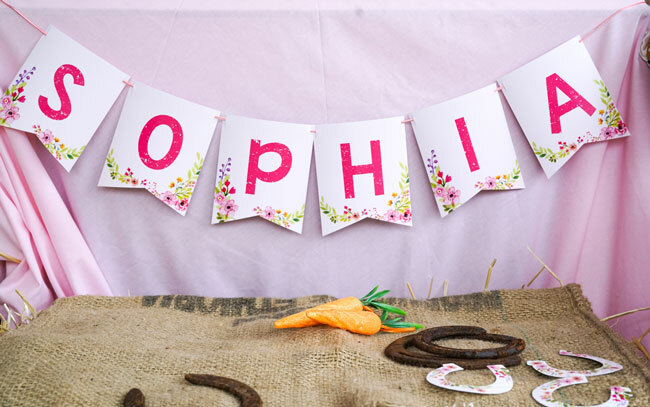 If your little girl loves horses, give her a happy birthday with a horse themed party like this one! There is something so pure and magical about the absolute love that little girls often have for horses and ponies. 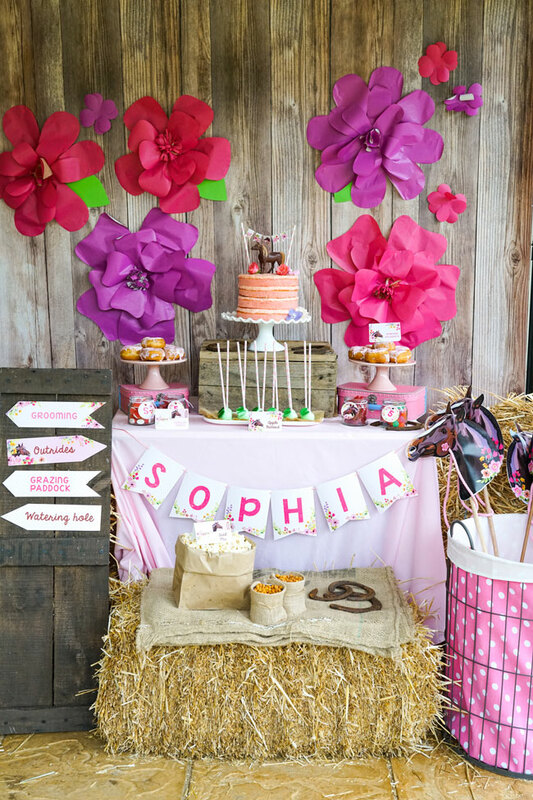 It is just like that for this little girl, who was begging for a Rustic Horse Birthday Party! Nothing could make her happier! So, the obvious choice for her 5th birthday party was to go all out with a really pretty horse-themed birthday party. 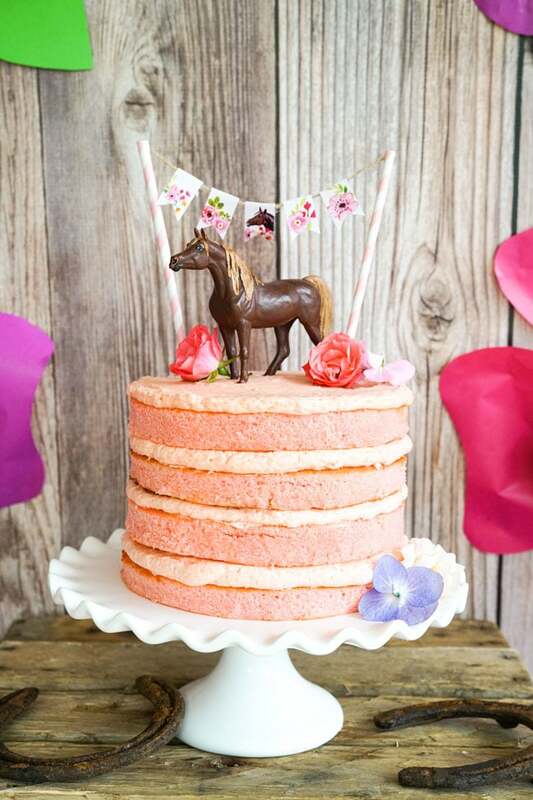 A girly horse party with lots of pink and flowers. Is it possible to be rustic and pretty and girly all at the same time? You bet! We introduce the beautiful “Rainbow”, the name the birthday girl gave the horse who stars in this party décor, and on top of her cake, and in her heart! 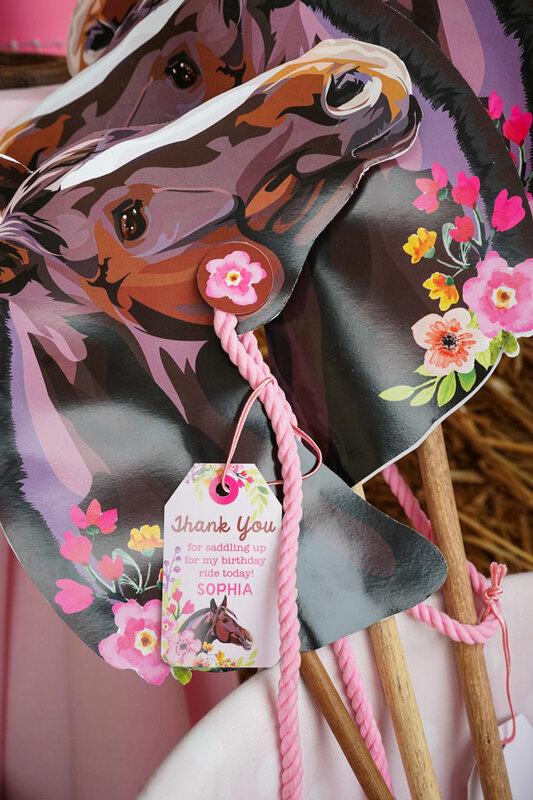 This rustic horse birthday party was so much fun for Sunshine Parties to create. 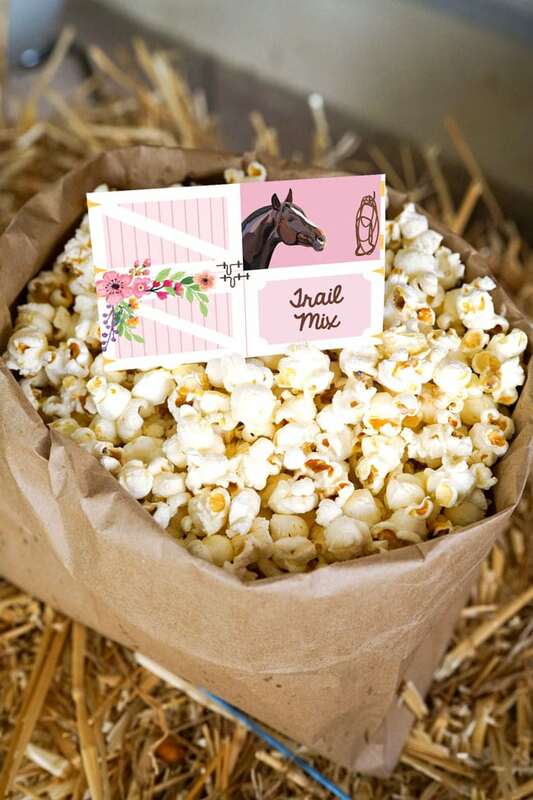 It combined flowers, burlap, hay bales, party printables and crafting printables. Giddyup! 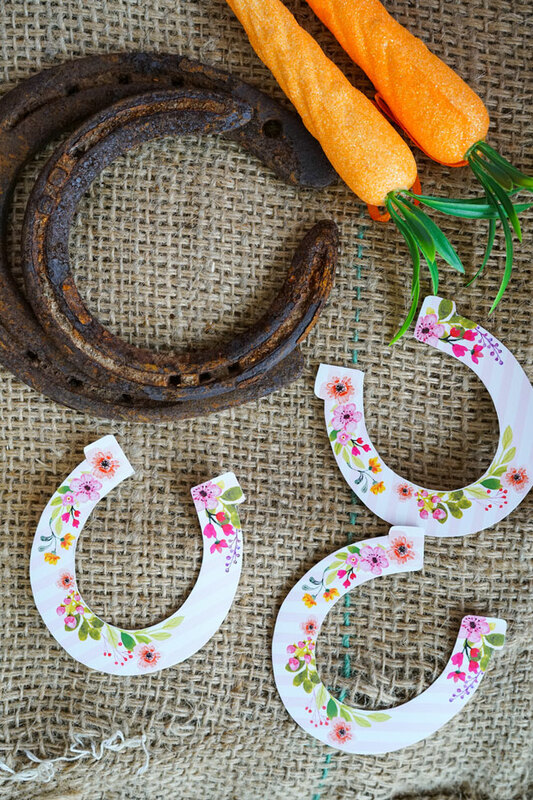 We love the gorgeous flower horseshoe cut-outs that can be used around the party for good luck! 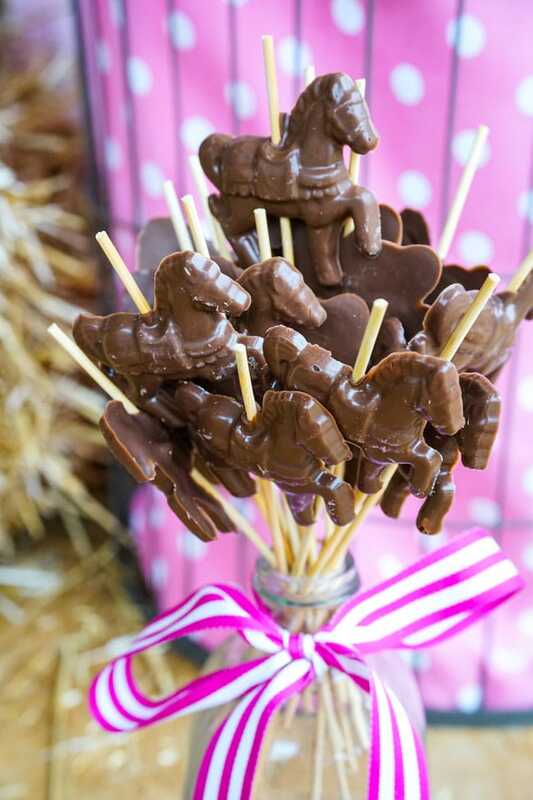 How delicious do these little horse chocolates look?! What a great addition to the desserts at a horse party! And on to the food! Food labels are a specialty of Sunshine Parties. They do an incredible job of creating tables with theme-relevant names! Try it, it is so much fun! And all these food label designs are editable so you can go wild creating the coolest food names. Or use these ones if you want to! 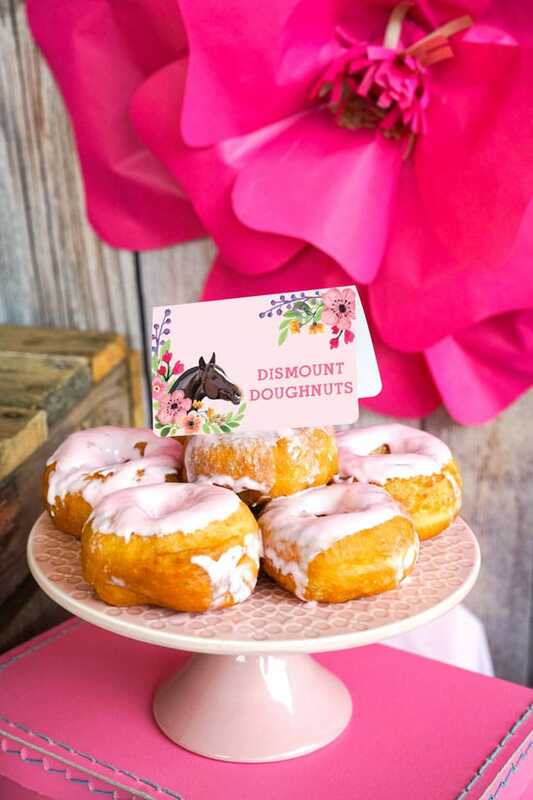 What a perfect idea for a rustic horse birthday party. Then there were a couple of jars of ‘Saddle Up Sweets’, just in case you needed to go for a ride! By the way, there was even a real, live pony giving rides at the party! We’re sure the birthday girl had a blast! What a cool surprise! What do you need when you are riding out on the range? A bit of trail mix of course! Note the burlap, and some old horseshoes to keep the theme alive at every turn of this fun horse birthday party! 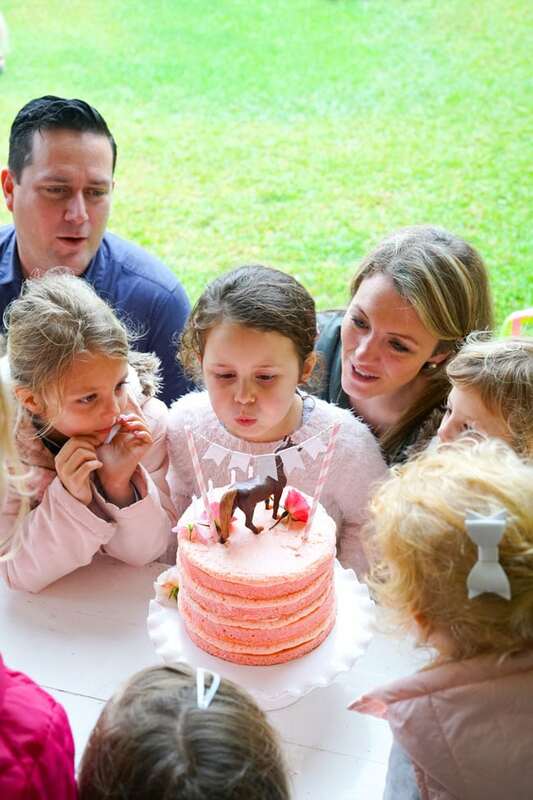 The birthday cake was kept simple and natural for this horse birthday party. A peach-colored naked sponge cake is set on a beautiful, raised white platter (always makes a world of difference). A version of “Rainbow,” proudly standing on top, and stunning fresh flowers bring in that feminine, girly touch! So there’s nothing rustic about these ‘Dismount Donuts’. All we can say is that they were a real hit with the guests, as were all of the horse party desserts! 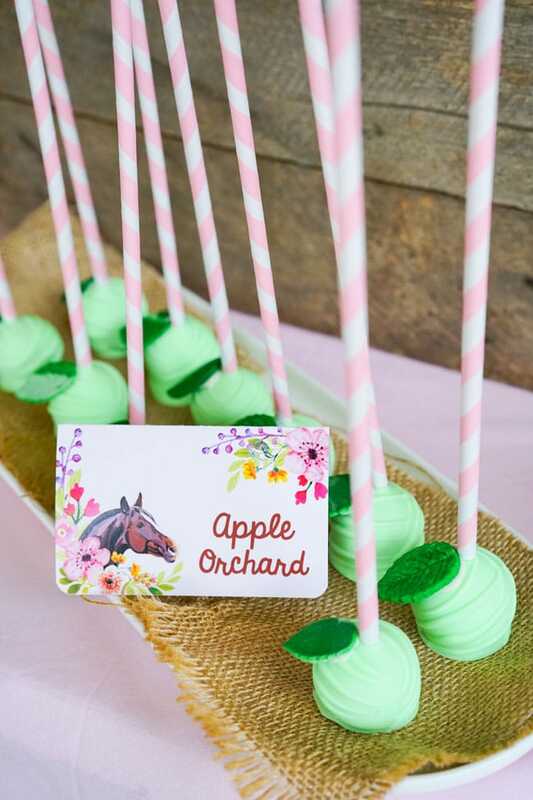 In green, with cute little fondant leaves, these cake pops were made to create an Apple Orchard of deliciousness. 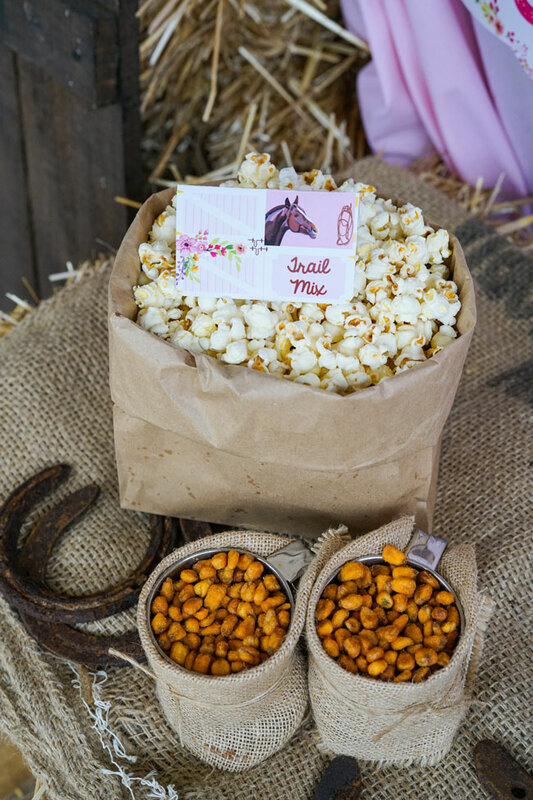 A lot of burlap was used in the detail of the party décor, as you will see, to bring that lovely natural, rustic feel into the décor of this happy birthday horse party! On to the cupcakes. 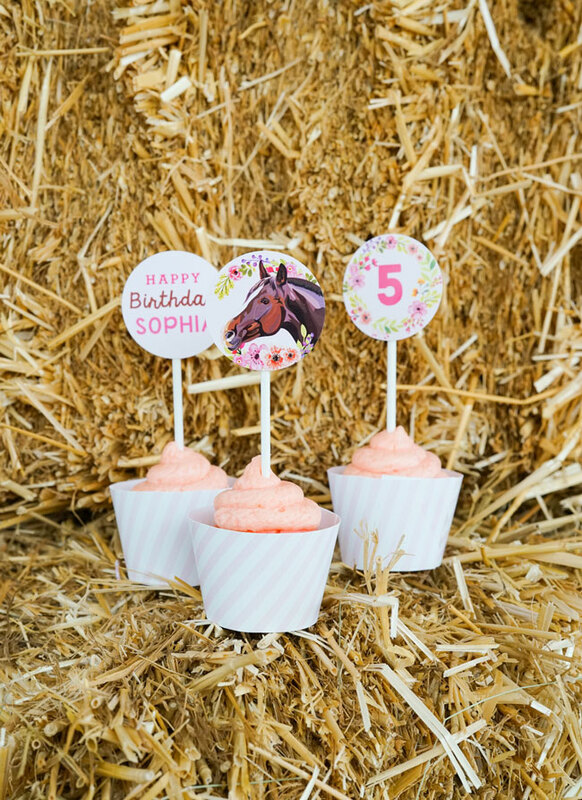 Are these not just the prettiest horse cupcake wrappers and toppers you have EVER seen?! 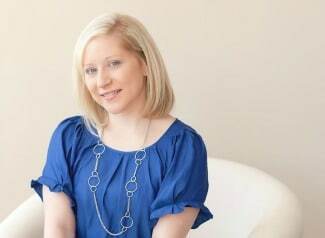 Sunshine Parties designs perfect party decor to fit any theme! They are editable, so you can put your own age, number or message. 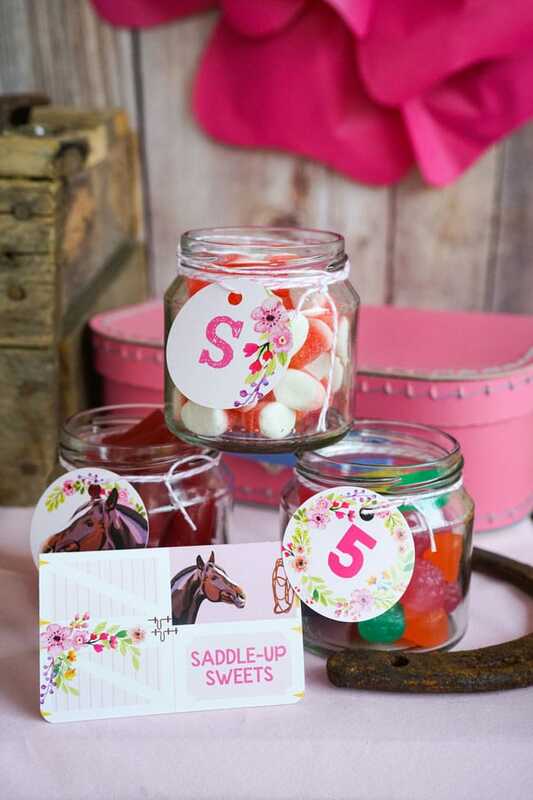 Pair it with soft pink candy stripe wrappers for the perfect horse themed cupcakes. Hay bales were an absolute must for this horse party, and look fabulous in the photos. A birthday banner to mark the occasion was used. You can edit as many panels as you like to read the birthday girl’s name or a special ‘Happy Birthday’ message. Letting your guests know where to go is imperative, and of course helps to set the theme from the start. 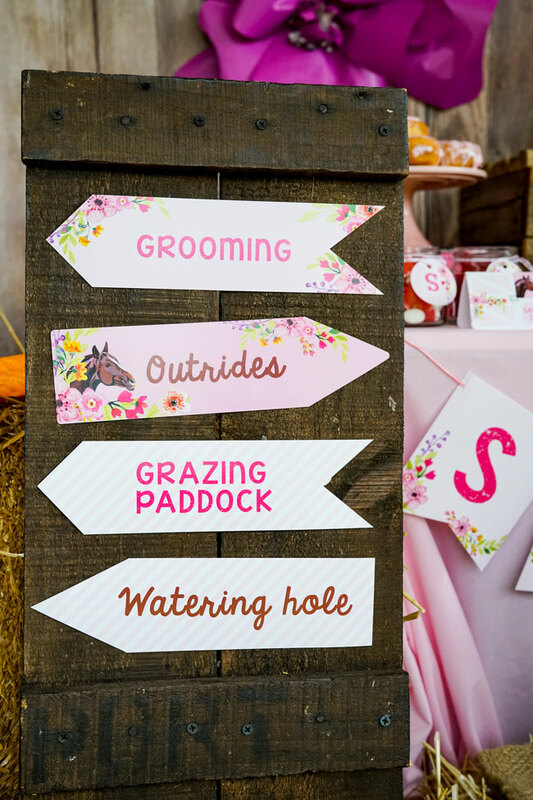 These directional party signs from Sunshine Parties are editable and add that lovely touch to the horse party theme. 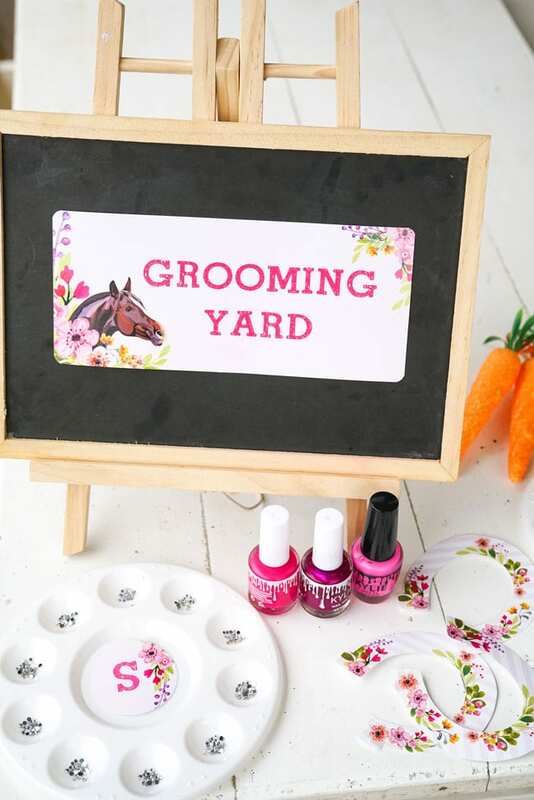 Being a very girly horse party, the girls just LOVED their ‘Grooming Yard’, a little station to sit down, hang your reins up and enjoy some much-needed pampering! Pink nail polish was the most popular among the girls – go figure! 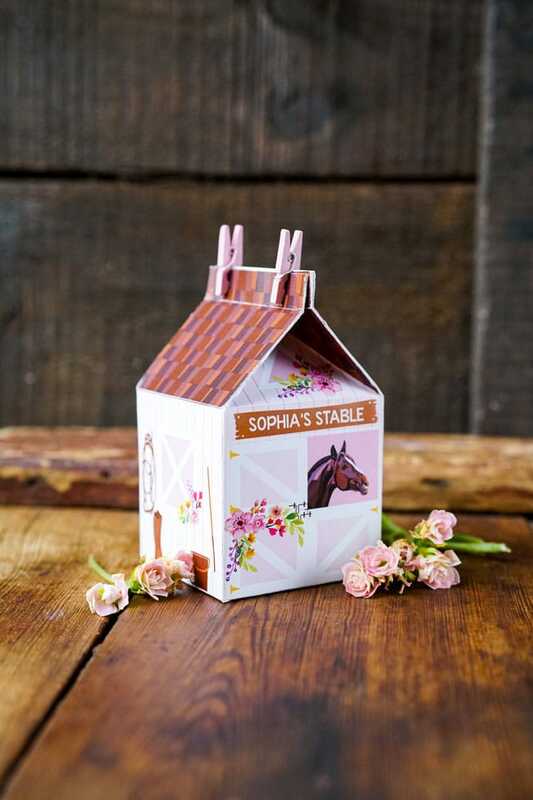 This GORGEOUS little milk carton stable was so fun to create! You can edit with your birthday girl’s name, print the template with its very clear lines and instructions, and assemble. 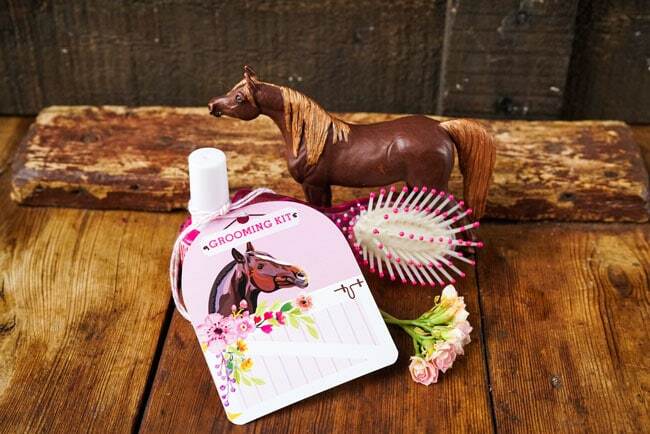 They just make the most adorable horse party favors. Don’t you agree? Get ready for the ULTIMATE party favor and activity! A gorgeous hobby horse, for gallivanting around on while waiting for your pony ride, or any time at all in fact was available from Sunshine Parties! These are really gorgeous to make, with a template (you can print and cut or use a Circut machine) and assemble with dowel sticks, some pretty pink rope for reins and these gorgeous cut out flowers. 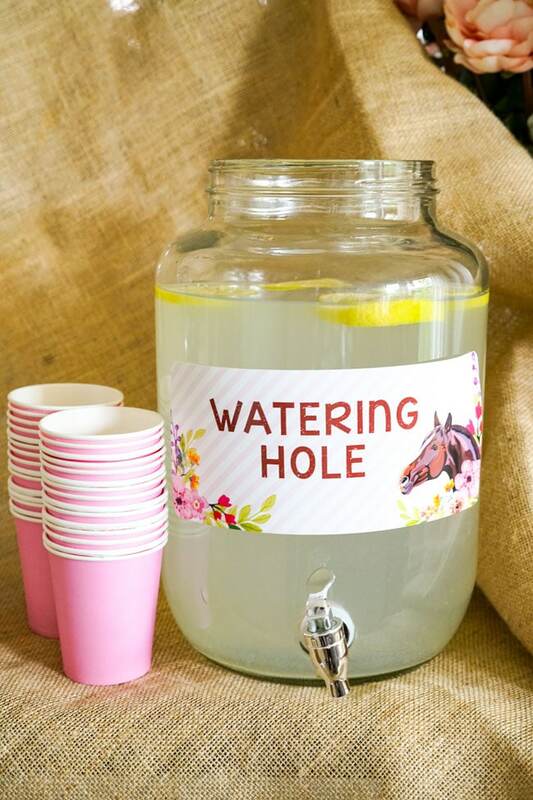 It’s a great DIY project for your horse party! The printable comes with detailed instructions. An editable favor tag completes this exciting party favor. 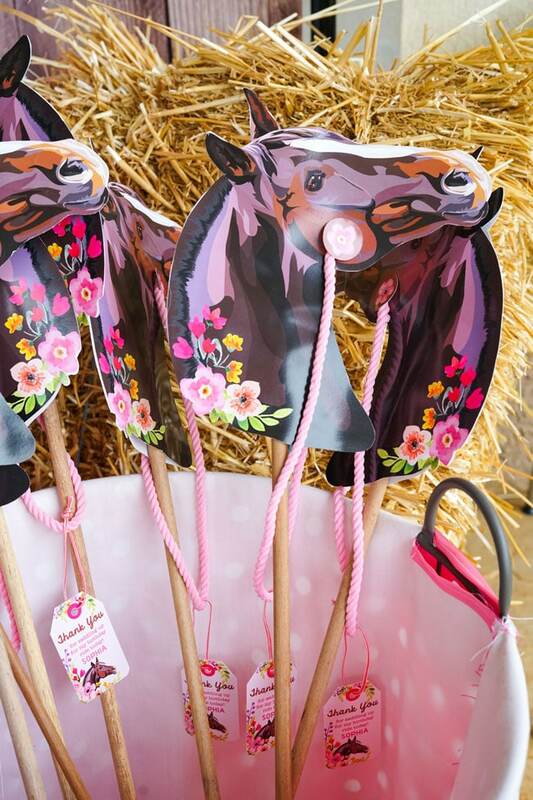 We’re sure all the girl’s faces just lit up when they saw these stick horses! Who could resist calling the lemonade the ‘Watering Hole’, with its own drink label? It was the perfect opportunity and of course the sign matched all the other horse party decorations and printables. 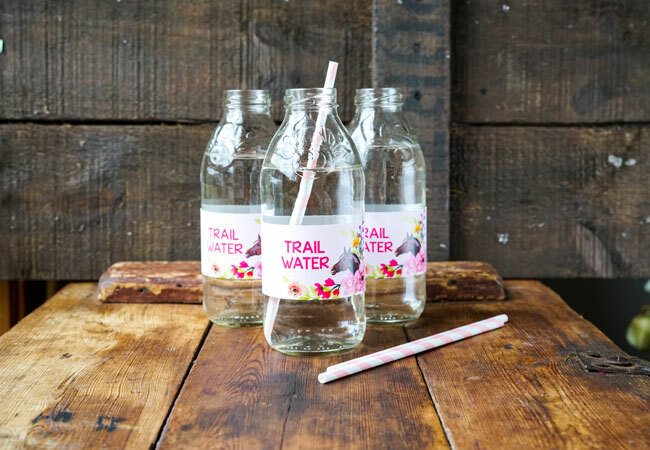 Everyone sure gets thirsty on the trail, so some ‘Trail Water’ definitely did the trick! Water never looked quite so pretty! Happy 5th Birthday to this special birthday girl! We’re sure she was a very tired birthday girl who gently drifted into horsey dreamland that night from her amazing Rustic Horse Birthday Party! What a happy birthday it sure was with this fantastic horse birthday party! What beautiful party idea, I love it!